For several weeks now my colleagues and I have been immersed in surveys for selected tiger beetle species in Missouri. We placed 50 pitfall traps in western Missouri and 75 in the southeastern lowlands in mid-June and have been checking them weekly for several weeks now. It’s been a frenetic schedule for all of us – working regular jobs all week and covering two different parts of the state during weekends. Add to that spouses, children, and the desire to watch television coverage of two little sporting events called Wimbledon and the Tour de France, and you have the makings of a severe case of sleep deprivation. Even with such a focused, dedicated effort success is not assured. 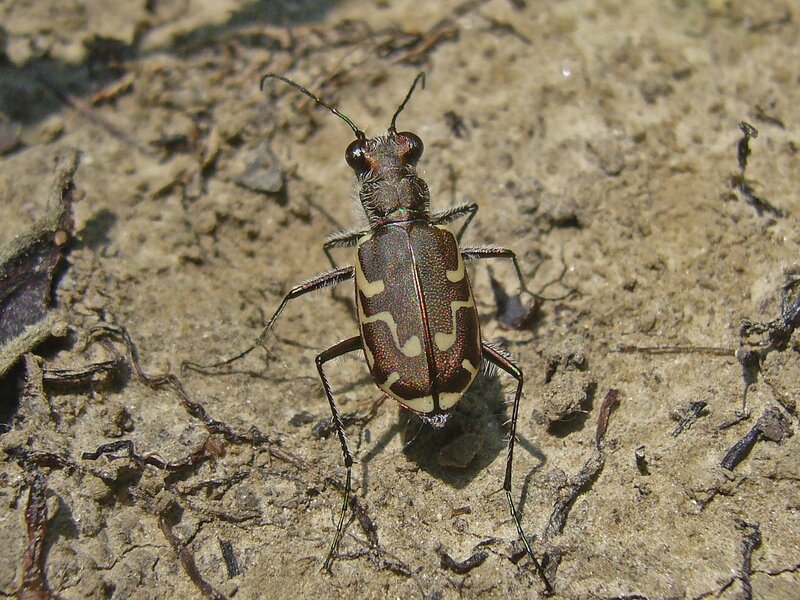 Our previous work over the past several years has generated copious data on the more common, widespread species of tiger beetles occurring in the state. The distributions and habitats of these species are well documented now – the low hanging fruit has been picked. 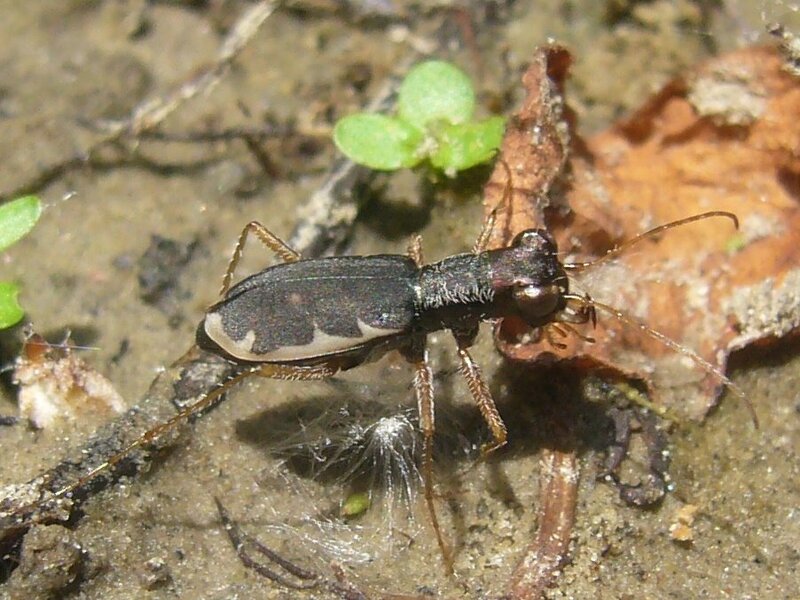 We’re now focusing on those few, rare species that I talked about in a previous post – the critically imperiled Cicindela circumpicta johnsonii, found in the equally critically imperiled saline spring habitats of central Missouri; Cicindela pruinina in western Missouri, normally associated with grasslands habitats further west; and the enigmatic Cicindela cursitans, until last year known in Missouri from just a single specimen collected somewhere “nr. Portageville” in the Mississippi lowlands of extreme southeast Missouri. While our survey efforts are still ongoing for the season, I’m happy to report that robust populations of Cicindela cursitans have been located at several spots along the Mississippi River. Many dozens of individuals were observed at two locations in Mississippi County, and another new population was located further south in New Madrid County. Combined with the sites discovered last year, this gives five confirmed sites for the species within the state. All of these sites share similar features – bottomland forest immediately adjacent to the Mississippi River, with an open understory dominated by poison ivy (Toxicodendron radicans) and trumpet creeper (Campsis radicans) (a ‘radical’ understory to say the least) on a ridge and swale topography of sandy loam soil. The beetles favor the relatively drier, more openly vegetated ridges but avoid areas of excessive sand. None were seen in the wetter sand beach areas leading down to the water’s edge, nor were any observed on the relatively sand-free soils found further away from the river. 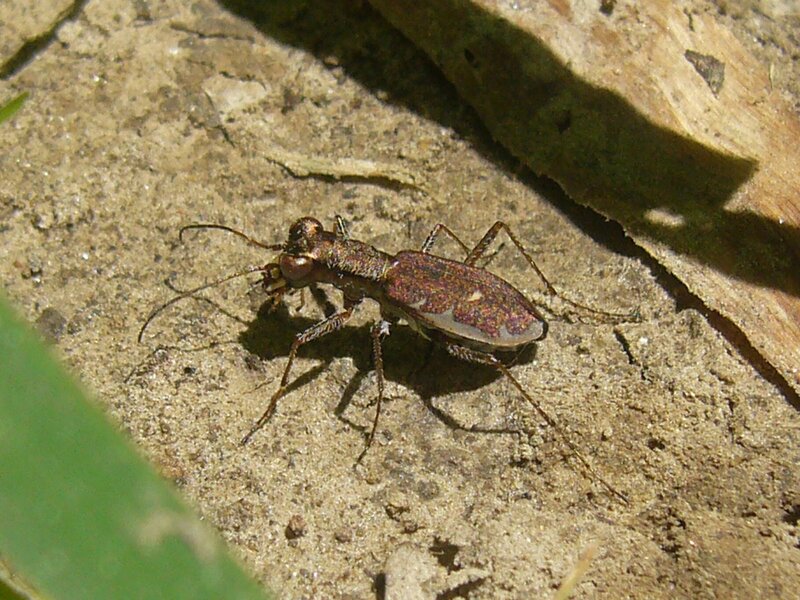 Unusual for tiger beetles, adults were never found in open sunny areas, being entirely restricted to forest habitats where they darted through the open understory from one poison ivy plant to another. This is in distinct contrast to the wet meadow habitats reported by Brust et al. (2005) for populations of this species in Nebraska. Their small size and rapid running capabilities made them quite difficult to capture or even to notice at first – appearing more like ants or small spiders. Of equal interest are the sites where the species was not observed, which include sites along the St. Francois River (western side of the Mississippi lowlands) and along the Arkansas border in between the two river systems. All of these sites offered similar bottomland forest, open understory, and ridge and swale soil topography, but they differ from the sites along the Mississippi River where the species was observed in that the soils are a heavy clay and contain no sand. It’s difficult to say conclusively that the species does not occur in these habitats, but the abundance with which we have observed it in the Mississippi River habitats is strongly suggestive. The Mississippi Lowlands of Missouri, once a vast assemblage of bald cypress (Taxodium distichum) and tupelo gum (Nyssa aquatica) swamps and mixed deciduous bottomland forest, have been almost completely drained, cleared, and converted to agriculture. Only small remnants of natural forest and swamp remain amongst the fields of soybean, wheat, corn, rice and cotton. Despite this, the ribbons of forest that occupy the narrow corridor between the Mississippi River and the levees that confine it seem to offer much potential habitat for Cicindela cursitans. Combined with their confirmed occurrence and abundance at several sites within this habitat, it appears that this species is secure within the state and will not require any special conservation measures to assure its continued presence. 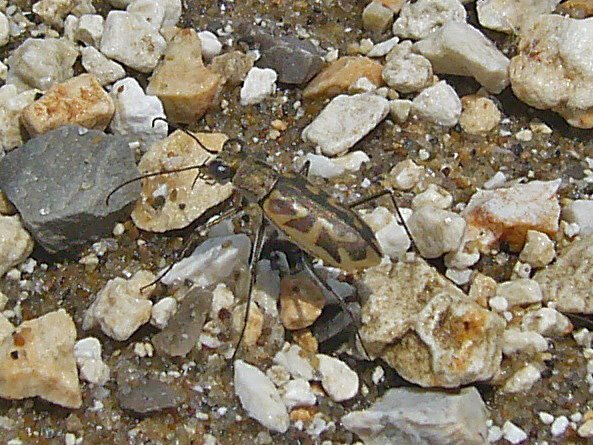 In celebration, I share with you some photographs of the adults, taken in their natural habitat at one of the Mississippi County sites, along with a few additional photos of some other tiger beetle species I observed on the wet sand beaches closer to the river’s edge. These latter three species are common in Missouri along the Mississippi and Missouri Rivers: Cicindela repanda (bronzed tiger beetle), Cicindela cuprascens (coppery tiger beetle), and Cicindela hirticollis shelfordi (hairy-necked tiger beetle). After taking pictures of these latter three species along the river bank amidst puzzled looks from a few of the locals, I had an amusing conversation with one of the more ‘colorful’ of them, who had come to the baffling conclusion that I could only have been taking pictures of rocks. I cleared up the confusion and showed him a few of the beetles, and we both returned to doing what we both love – drinking beer and looking for beetles (respectively, that is!). This entry was posted in Cicindelidae, Coleoptera and tagged beetles, conservation, entomology, insects, nature, science, tiger beetles. Bookmark the permalink. I’m a naturalist and amateur entomologist in California. I’ve just got to say CONGRATS on a wonderful blog entry; I’m really enjoying going through your archives and pictures! This article, especially, is fantastic and I’m forwarding it to my entomology professor who is a huge Cincidelan enthusiast. I second the first commenter. Great post and great blog. I am an amateur entomologist / ornithologist (basically, I just like to photograph / ID bugs and birds), and I think your blog is great. I’m going to link you and come back often! So, southeast Missouri still has a semblance of biodiversity? Kent and I commiserated over the paucity of habitat, etc., but to see what you’ve seen! Bravo! 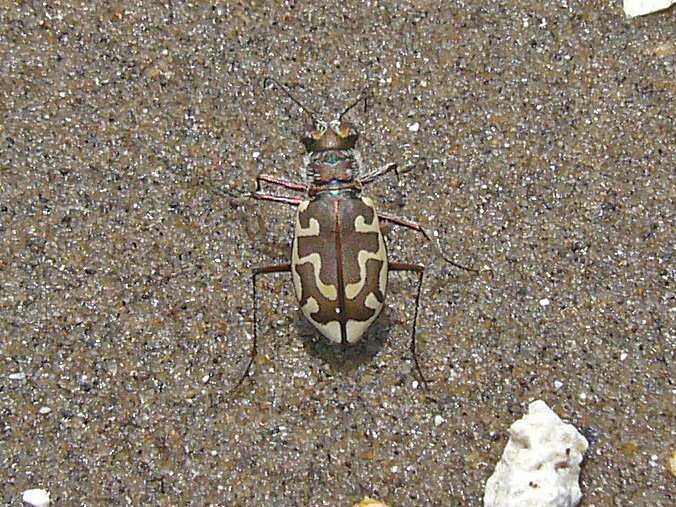 Is it possible that I saw a tiger beetle at Grasshopper Hollow NA? Deep in the fen? Keep up the great work, Ted. You’re utterly brilliant. 10,000 Insect species for Sale!!! and 74 others from the Cicindela genus. Can you send to the “Beetles in the Bush” author because I would like to gain a perspective on this type of business, and just how common it is. I know I sound naive – I am. It would never occur to me to start a business like this, and esp. for some G1 and G2 species. Dan and moe – thanks for stopping by, and I’ve enjoyed looking through your blogs as well. Allison – tiger beetle at Grasshopper Hollow? Hmmm, I don’t know – they generally prefer sparsely vegetated to unvegetated habitats. Perhaps, though. The link your friend from Mark Twain sent is one of the larger of many commercial dealers in insect specimens. It’s the seamier side of insect collecting – a purely philatelic approach in which a collection’s value is placed wholly upon the specimens within rather than the scientific data they represent. They (the dealers) rely upon a network of suppliers who plunder local populations of difficult to obtain species for a ‘cut’ of monetary value. I detest such ‘for profit’ collecting, which rightly has become more difficult in recent years due to a growing trend by administrators of public lands to require collecting permits. I rejoice everytime I read news of someone prosecuted for being caught collecting in a national park or foreign country without the requisite permit – which they generally cannot obtain to begin with because of their inability to demonstrate valid research purpose and/or bona fide institutional affiliation. One insect dealer in Texas was raided by FWS agents some years ago and all his inventory confiscated for taking a “source unknown” approach with his suppliers. The market for commercially supplied specimens is particularly high in Japan. Nevertheless, I’m not too concerned about the conservation status of our disjunct vulturina population – an abundance of habitat and strong escape and dispersal capabilities should be enough to secure its presence in the White River Hills.